Laneway & Co is part of the recent surge of speciality coffee shops in Newcastle. Opening in July last year, I missed it by just a couple of months, having been up in May to check out the likes of Hatch Coffee. Instead I had to settle for catching up with it on my return on a dark, December day, at which point it had been open for five months. Laneway & Co is, perhaps, the most London-like of all Newcastle’s speciality coffee shops, with a somewhat austere, tiled interior that is reminiscent of many a coffee shop in the likes of, say, Fitzrovia. This London connection is reinforced by the coffee, with the Allpress Redchurch blend on espresso, while the guests, while I was there at least, were from Caravan and, before that, Square Mile. Although there is a small selection of cake and a couple of sandwiches, the focus is firmly on the coffee. As well as Allpress on espresso, the two or three guest beans are available as filter, each matched to a specific method, either Aeropress or V60. If you’re looking for alternatives, there’s tea from Brew Tea Co and single-origin hot chocolate from Kokoa Collection. Laneway & Co occupies a small spot on Newcastle’s High Bridge, which, in a city full of bridges, is (as far as I can tell) neither a bridge nor connected to a bridge. Instead, it’s a narrow street connecting the Bigg Market (west) with Grey Street (east). On the north side of the street, you might think that it would catch the sun, but High Bridge’s lack of width, coupled with high buildings on either side (four storeys) means that it’s not the brightest spot. Laneway & Co makes the most of what natural light there is, the entire front being glass, with a glass door on the left and a floor-to-ceiling window on the right. Inside it’s long and thin, with a somewhat awkward layout, necessitated by the stairs on the left-hand side. These run from the back down to the basement (sadly there’s only a toilet and storeroom down there; no Best Basement Award for Laneway & Co) making it even narrower. However, Laneway & Co has turned this into a feature by putting the counter opposite it against the right-hand wall, splitting the shop into two spaces, connected by a long corridor. At the front is a three-person window-bar to the right of the door, with the remaining seating at back. A padded bench runs along the back wall with, from right-to-left, a three-person, two-person and four-person table. There’s a two-person table against the left-hand wall between the back and the stairs, plus another one, freestanding to the right, between the counter and the back. That’s it for seating, other than a narrow bench outside on the pavement. The interior décor can best be described as austere, with white-painted walls and ceilings, a white, hexagonal-tiled counter and, for contrast, a wooden floor and counter-top. This, however, leaves the focus clearly on the coffee. As well as what’s on offer on espresso/brew bar, there’s a wider range of beans for sale from the guest roaster (which changes every few weeks). If you would like to try a specific bean, you can ask baristas nicely and they’ll make one for you. Another nice touch is Laneway & Co’s attitude to reusable cups which are for sale at subsidised prices. If that wasn’t enough, you also get your first coffee free, an attitude I wish more coffee shops would take. In Laneway & Co’s case, the cup of choice is the KeepCup, with both glass and plastic versions for sale. I arrived hungry, so had a brie, grape, rocket and mustard toasty (the alternative was a ham, edam, cheddar and mustard). This was made with some wonderfully crunchy sour-dough toast and done to perfection, with the brie just about melted. 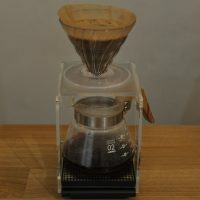 Since I know the Redchurch blend from Allpress quite well already, I decided on a filter and, after a brief discussion with the barista, selected the La Palmera from Costa Rica which was made using the V60 and served, as it should be, in a carafe with a cup on the side. I took this to the back of the store, where I bagged a table and enjoyed the quiet, relaxed atmosphere of Laneway & Co. The coffee itself was quite delicate and held its own as it cooled, with its fruity nature really coming out as it got cold. If you enjoyed this Coffee Spot, then take a look at the rest of Newcastle’s speciality coffee scene with the Coffee Spot Guide to Newcastle & Gateshead. This entry was posted in Cake, Coffee Shops, Laptop Friendly, Newcastle & Gateshead, Retailers, Sandwiches and tagged include by Brian Williams. Bookmark the permalink.